After a week of summer weather, it seemed Vancouver didn’t want to cooperate with the season and grey skies, rain and cool weather arrived again. I don’t mean to be pushy, but dammit, let’s get on with summer already! This morning does seem to be warming up and I see blue skies and the sun peeking out, so I’m keeping my fingers crossed. But maybe I’ll have to chant some kind of mantra over and over again: c’monsummerc’monsummerc’monsummerc’monsummer…. Last week when it was warm outside, we ate this meal out on our balcony with a couple of icy cold beers. A cold salad dressed with a tart lemony dressing, chock full of green beans and fresh garden herbs…it seemed like there was no question about it: summer was here to stay. I’m hoping that by adding this recipe to my archives, summer will stay put. And if you are spending your summer reading fashion & lifestyle magazines by the pool, be sure to check out the July issue of Chatelaine magazine (a popular Canadian mag). I was recently interviewed (briefly) by one of their writers about How to Start a Blog. Check it out! 1. In a dry pan, toast the quinoa until it gets golden and start to jump around. Remove from heat and rinse well under cold water. Meanwhile, in a medium sized pot, add the stock and bring to a boil. Add the rinsed quinoa to the stock and simmer for about 20 minutes or until the quinoa is dry and fluffy. 2. In another pot, steam the green beans until bright green but still crisp. Rinse well under cold water to prevent further cooking. 3. Mix the lemon juice, zest, garlic, olive oil, salt & pepper into a dressing. 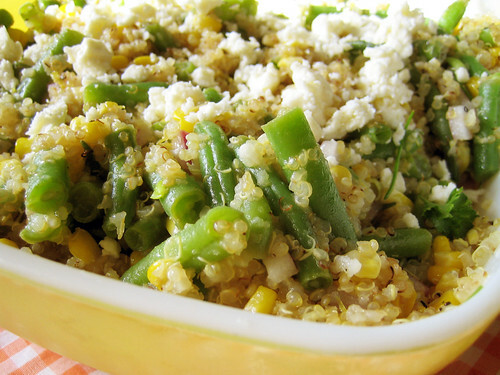 Place the quinoa, green beans, corn, red onion and fresh herbs into a serving bowl and toss with the dressing. Chill until cool. Garnish with crumbled feta cheese. I haven’t been able to bring myself to try making quinoa again since my disastrous attempts earlier this year. Congrats on the mention in the article! Very neat. Mm, I can’t wait to make that salad. Too bad I don’t have any green beans, or I’d make it right now! Oh, it looks good, kickpleat! I have recently taken to quinoa myself (I’ll be posting a recipe soon). I was really thrilled to discover that I could use my rice cooker to make the quinoa, too – I use the same proportions as for basmati rice, on the “quick” setting for white rice. Quinoa is awesome! I love the taste, and the nutritonal profile is quite impressive. It makes a nice change from rice, couscous, and other side dishes. I really like that it doesn’t get all hard, like some types of rice do, when it cools. I’ll have to try version one, too. I have been tempted on occassion to start up a blog myself but, I’m not a journal keeper or a diary person. Writing down my thoughts just never appealed to me. But an image blog now that’s something I could do! Quinoa is a popular grain in my home and I have made it many times. I will have to try this recipe one day soon. looks wonderful, i love the salty feta kick in summer grain salads! dawna, i’m new to quinoa too! i’m not sure if it’s just me, but doesn’t it smell like peanut butter when it’s cooking? strange! thanks sara! you should definitely give quinoa another go. judy, i think this salad could be modified very easily. use broccoli or edamame or even cauliflower or tomatoes! wellunderstood, the feta is like the cherry on top. so good!